In this article, we will discover how Alibaba Dragonfly file distribution system helps support the annual Alibaba Singles' Day (Double 11) online shopping festival. During the 2017 Alibaba Singles' Day (Double 11) online shopping festival, transaction values peaked at 325,000 per second, payments at 256,000 per second, and database requests at 42 million per second, once again breaking new records. During Double 11, the Alibaba Group infrastructure component Dragonfly sent down 5 GB of data files simultaneously to over 10,000 servers, enabling reliance on the Dragonfly system for perfect implementation of large-scale file distribution. Alibaba Dragonfly is an intelligent P2P based image and file distribution system. It resolves problems in large-scale file distribution scenarios such as time-consuming distribution, low success rates, and bandwidth waste. It significantly improves business capabilities such as distribution deployment, data pre-heating, and large-scale container image distribution. Within Alibaba, Dragonfly has already exceeded an average of 2 billion distributions per month, distributing 3.4 PB of data, and succeeding in becoming part of Alibaba's infrastructure. Container technology brings convenience to operation and maintenance (O&M), but also presents massive challenges to image distribution efficiency. 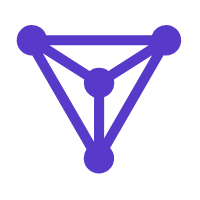 Dragonfly supports many kinds of container technology, such as Docker and Pouch. Once Dragonfly is used, image distribution can be accelerated by as much as 57 times and data source network export traffic reduced by over 99.5%. Dragonfly can save bandwidth resources, upgrade O&M efficiency, and reduce O&M costs. Dragonfly is a P2P file distribution system that is a product of Alibaba's own research. It is an important component of the company's basic O&M platform, and forms the core competitiveness of its cloud efficiency°™a smart O&M platform. It is also a crucial component of its Cloud Container Service. Its inception, though, was the subject of discussion for 15 years. Following the explosive growth of Alibaba's business, in 15 years its system's daily distribution volume exceeded 20,000, and the scale of many applications began to exceed 10,000, while the distribution failure rate began to increase. The root cause was that the distribution process requires the haulage of a large volume of files. The file servers couldn't handle the large demands made of them. Of course it's easy to speak of server expansion, but once the servers are expanded, one discovers that back-end storage has become a bottleneck. Apart from this, large quantities of requests from a large number of IDC clients used up huge network bandwidth, causing network congestion. At the same time, many businesses were moving towards internationalization and a large amount of application deployment was overseas. Overseas server downloading relies on back-to-origin domestic operations, wasting a large volume of international bandwidth as well as being very slow. If failure occurs and repetition is necessary when large files are being transmitted and the network environment is poor, efficiency is extremely low. So we naturally thought of P2P technology. Because P2P technology was not actually new, however, we also investigated many other domestic and overseas systems. Our conclusion, though, was that the scale and stability of these systems could not meet our expectations. That's how Dragonfly came into being. To solve the problem of file sources being blown out, a P2P network was organized between hosts, alleviating pressure on the file servers, and saving bandwidth resources that spanned IDC. Accelerating file distribution speeds and ensuring that the fluctuations between over ten thousand servers downloading and one server downloading were not too significant. Resolving transnational download acceleration and bandwidth saving. In solving the problem of large file downloads, it is necessary to also support continued transmission during power failures. The host's computer disk IO and network IO must be capable of being controlled in order to avoid impacts on business. The entire architecture is divided into three layers. The first layer is Config Service. It manages all the cluster managers. 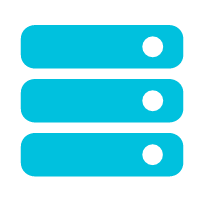 The cluster managers in turn manage all the hosts. The hosts are terminals. Dfget is a client sequence similar to wget. 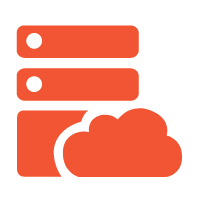 Config Service is mainly responsible for such matters as cluster manager management, client node routing, system configuration management, and pre-heating services. Put simply, it is responsible for informing the host of the address lists of the team of cluster managers nearest to it, and periodically maintaining and updating this list, so that the host can always find the cluster manager nearest to it. The cluster manager has two main duties. The first is to download files in passive CDN mode from the file source and generate a set of seed block data. The second is to construct a P2P network and dispatch the block data designated for mutual transmission between each peer. Dfget is then stored at the host. The syntax of dfget is very similar to that of wget. The main functions include such things as file downloading and P2P sharing. Within Alibaba, we can use StarAgent to distribute dfget commands downwards to enable a set of machines to download files simultaneously. In certain kinds of scenario, a set of machines might be all of Alibaba's servers. So its use is highly efficient. Apart from clients, Dragonfly also has Java SDK, which can enable you to "push" files onto a set of servers. 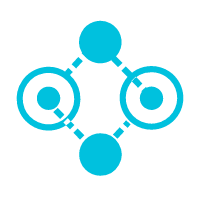 Two hosts and one CM form a P2P network. First of all, the CM will check whether the local area has a cache. If it doesn't, then it downloads one on a back-to-origin basis. Of course the files will be separated into shards. The CM will download these shards in multiple threads. At the same time, it will provide these downloaded shards to the host. After the host has downloaded a shard, it will simultaneously provide it to its peers for download. When it has reached all the hosts, the entire download is complete. When the download is underway at the locality, the circumstances of the shard download will be recorded in the metadata. If the download is suddenly interrupted, the dfget command is once again executed and transmission will continue despite the power failure. When downloading has finished, the MD5 will also be verified by comparison in order to confirm that the downloaded files are perfectly identical to the source files. Dragonfly controls the cache duration on the CM side using the HTTP cache protocol. Of course, the CM side also has its own ability to clean the disk periodically, to confirm that it contains sufficient space to support long-term service. At Alibaba, there are also many file pre-heat scenarios in which it is necessary to push files to the CM side in advance. These include such files as container images, index files, and business optimization files. The x-axis shows client volume. The y-axis shows download duration. File source: test target file 200 MB (network adapter card: Gbps). Host: 100 Mbps network adapter card. CM: Two servers (24 core, 64 G, network adapter card: Gbps). The traditional mode increases with the client, the download duration increases accordingly, and the fact that dfget can support up to 7,000 clients still hasn't been improved. After the traditional mode has reached 1,200 clients there is no more data because the data source has been blown out. The period before Double 11 every year is peak distribution period. Dragonfly exceeded perfection during Double 11 2015. After Double 11 2015, Dragonfly achieved a download rate of 120,000 per month and a distribution volume of 4 TB. During that period, other download tools were used at Alibaba, such as wget, curl, scp and ftp, as well as small-scale distribution systems of our own construction. Apart from our full-coverage distribution system, we also conducted small-scale promotion. By around Double 11 2016, our download volume reached 140 million per month, and our distribution volume 708 TB. After Double 11 2016, we proposed an even higher objective. We hope that 90% of Alibaba's large-scale file distribution and large file distribution business will be undertaken by Dragonfly. We hope that Dragonfly will become group-wide infrastructure. To optimize our overall situation. As long as the Dragonfly system is optimized, the entire group can benefit. We found, for example, that system files are distributed by the entire network every day, and if these files alone could be compressed, we could save the company 9 TB of network traffic daily. Transnational bandwidth resources are particularly valuable. If everyone used their own distribution system, this kind of optimization of our overall situation wouldn't even need to be discussed. So integration is absolutely imperative! Based on the analysis of large quantities of data, we concluded that the entire group's file distribution volume was approximately 350 million per week, and our proportion at that time was not even 10%. After half a year's hard work, in April 2017, we finally achieved this objective: a share of more than 90% of the business. The business volume grew to 300 million files per week (basically according with the data from our earlier analysis). The distribution volume was 977 TB. This figure was greater than the volume for the month half a year previously. Of course, we are bound to point out that this is intricately connected to Alibaba's containerization. Image distribution accounts for approximately one half. 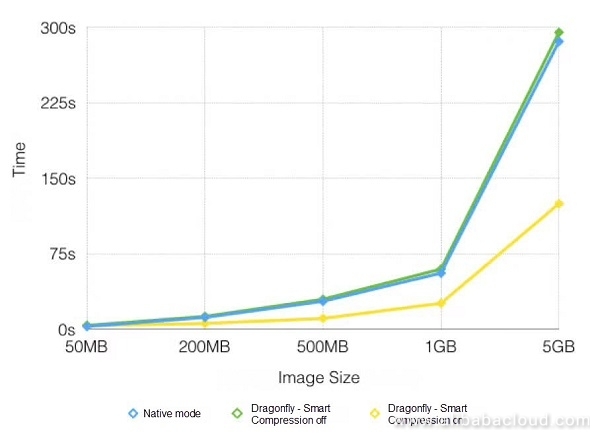 Below, we provide an introduction to the way in which Dragonfly supports image distribution. Before discussing image distribution, however, we must of course discuss Alibaba's container technology. The strengths of container technology naturally need little introduction. From a global perspective, Docker enjoys the greatest share of the container technology market. Of course, apart from Docker, other solutions exist, such as rkt, Mesos Uni Container, and LXC, while Alibaba's container technology is called Pouch. As early as 2011, Alibaba, on its own initiative, researched and developed the LXC container, T4. At that time, we hadn't created the concept of the image. T4 nevertheless served as a virtual machine, but of course it had to be much lighter than that. In 2016, Alibaba made major upgrades on the basis of T4, which evolved into today's Pouch. This was already open source. Currently, Pouch container technology already covers almost all of the business departments in the Alibaba Group. Online businesses are 100% containerized to scales as high as several tens of thousands The value of image technology has expanded the boundaries of the application of container technology, and in Alibaba's huge application scenarios, how to achieve highly efficient "image distribution" has become a major issue. Returning to the level of the image. From a macro perspective, Alibaba has container application scenarios of enormous scale. From a micro perspective, when each application image is being formed, the quality lies in unevenly matched circumstances. In theory, with imaging or traditional "baseline" methods, as far as the application's size is concerned, there shouldn't be extremely large differences. In fact, this depends completely on whether the Dockerfile is written well or badly, and on whether the image layering is reasonable. Best practice actually exists within Alibaba, but each team's understanding and acceptance levels are different. There will certainly be differences between good and bad usage. Especially at the beginning, everyone turns out some images of 3 to 4 GB. This is extremely common. So, as a P2P file distribution system, Dragonfly is in a favorable position for the use of its skills, regardless of how large the image is or how many machines it has to distribute to. Even if your image is created extremely badly, we always provide extremely highly efficient distribution. There will never be a bottleneck. So, this is a quick promotion of container technology, enabling everyone to understand the container O&M methods and giving ample time to digest it all. Taking Alibaba Cloud Container Service as an example, traditional image transmission is as the graph shows. Of course, this is the most simplified type of architectural method. Actual deployment circumstances will be much more complex and will also take account of such matters as authentication, security, and high availability. It can be seen from the above graph that image transmission and file distribution experience similar problems. When 10,000 hosts make simultaneous requests to a registry, the registry will become a bottleneck. Also, when overseas hosts visit domestic registries, such problems as bandwidth wastage, lengthened delays, and declining success rates will occur. Docker Daemon invokes the manifest for registry API image acquisition. From the manifest, it can figure out the URL for each level. Soon afterwards, Daemon performs a parallel download of the image layers from the registry to the host's local database. Ultimately, therefore, the problem of image transmission becomes the problem of concurrent downloading of each image-layer file. But what Dragonfly is good at is precisely using the P2P mode to transmit each layer's image files to the local database. So, specifically, once again, how do we make this happen? First of all, the docker pull command is intercepted by the dfget proxy. Then, the dfget proxy sends a dispatch request to the CM. After the CM receives the request, it investigates whether the corresponding downloaded file was already cached locally. If it wasn't, then it downloads the corresponding file from the registry and generates seed block data (as soon as the seed block data is generated it can be used). If it was already cached, then block tasks are immediately generated. The requester analyzes the corresponding block task and downloads block data from other peers or supernodes. After all the blocks from a layer finish downloading, the downloading of one layer is also complete. Similarly, after all the layers finish downloading, the whole image has also finished downloading. Large-scale simultaneous distribution: must be able to support a 100,000-level simultaneous pull image scale. Non-intrusion into the internal core of container technology (Docker Daemon, registry). In other words, it cannot alter any container service code. Support of all container and virtual machine technologies, such as Docker, Pouch, Rocket, and Hyper. Support of image warm-up (pushes to Dragonfly cluster CM during construction). Supports large image files (at least 30 GB). Native and Dragonfly's (closed smart compression properties) average times elapsed are basically approximate, though Dragonfly's is slightly higher. This is because Dragonfly, during the download process, will check the MD5 value of each block of data, and after downloading finishes, it will also check the MD5 of the whole file, in order to ensure that the file source is identical. When smart compression is activated, however, its time elapsed is lower than Native mode. 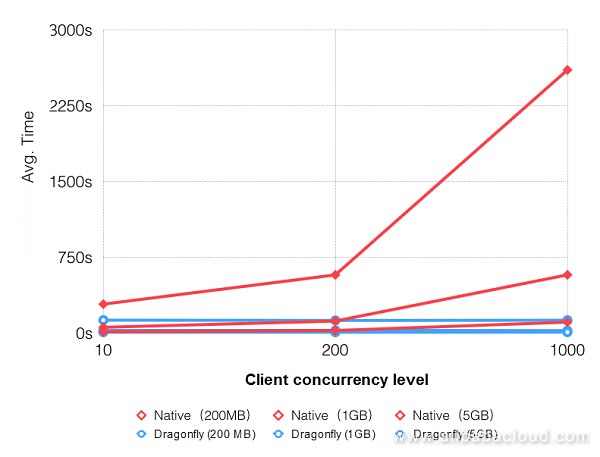 We can see from the above graph that, in line with the expansion in download scale, the difference between times elapsed for Dragonfly and Native modes is significantly increased. The highest availability can be accelerated by up to 20 times. In the test environment, source bandwidth is extremely important. If the source bandwidth is 2 Gbps, speeds can be accelerated by up to 57 times. The graph below shows a comparison of overall file traffic (concurrency x file size) and back-to-origin traffic (traffic downloaded through the registry). 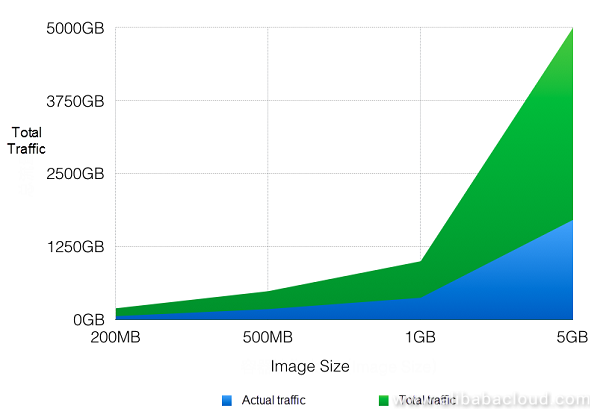 To distribute 500 M of images to 200 nodes uses less network traffic than Docker native mode. Experimental data makes clear that after Dragonfly is adopted, outward registry traffic decreases by over 99.5%, and, at a scale of 1,000 concurrencies, outward registry traffic can decline by approximately 99.9%. Alibaba has already committed to the use of Dragonfly for about two years, during which business has developed rapidly. Statistics on the number of distributions currently show 2 billion per month, distributing 3.4 PB of data. The volume of container image distribution accounts for almost half of this. 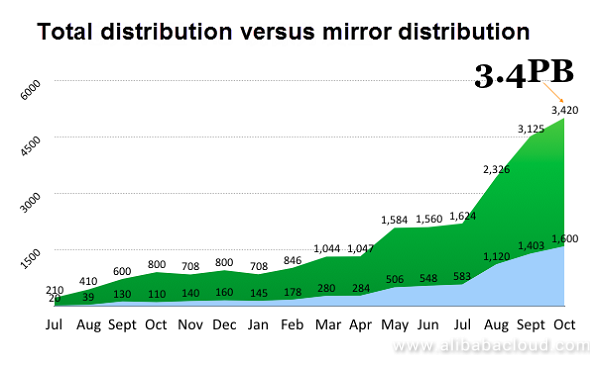 The largest single distribution at Alibaba was in fact during this year's Double 11 period. Over 5 GB of data files had to be distributed simultaneously by more than 10,000 servers. Traffic control is commonly observed in road traffic. In the speed-limit regulations on Chinese roads, for example, the speed limit on highways without center lines is 40 km/h. By the same token, only one public road for motor vehicles has a speed limit of 70 km/h. On high-speed roads, it is 80 km/h, and the maximum speed limit on freeways is 120 km/h. These kinds of limits are the same for all vehicles: clearly not flexible enough. So, in circumstances in which the road is extremely clear, resources are in fact heavily wasted and overall efficiency is extremely low. Traffic lights are actually a means of controlling traffic. Current traffic lights all operate according to set times. They can't make smart judgments based on actual traffic flows. So at the Yunqi Conference held in October last year, Dr. Wang Jian lamented that the longest distance in the world was not that between the North and South Poles, but that between a traffic light and a traffic surveillance camera. They are positioned on the same pole, but were never connected by data. The traffic light's actions will never become the target of the surveillance camera. This wastes cities' data resources and increases their business development costs. Block job scheduling is the critical element in determining whether the distribution rate is high or low. If performed merely by a simple scheduling strategy, such as according to the situation or other fixed priority scheduling, it will always cause fluctuations in the regularity of download speed, easily leading to excessive downloading glitches, and, at the same time, very poor download speeds. We made countless attempts and probes to optimize job scheduling, ultimately adopting multi-dimensional data analysis and smart trends to determine requesters' optimal follow-up block job lists. The many dimensions included machine hardware configuration, geographical position, network environment, and historical download results and speeds. The data analysis mainly used gradient descent algorithms and other follow-up algorithms. Smart compression implements an appropriate compression strategy for the part of the file that most merits compression, and can thereby save large volumes of network bandwidth resources. As to the current actual average data of container images, the compression ratio is 40%. In other words, 100 MB of data can be compressed to 40 MB. On a scale of 1,000 concurrencies, traffic flow could be reduced by 60% using smart compression. Supports HTTP header data in order to support file sources that have to perform verification by means of the header. Uses symmetric encryption algorithms, applying transmission encryption to the file contents. Dragonfly resolves large-scale file downloading and all kinds of difficult file distribution issues in cross-network, isolated scenarios using P2P technology combined simultaneously with smart compression, smart traffic control, and a wide range of innovative technologies. This significantly improves data preheating, large-scale container image distribution, and other business capabilities. Dragonfly supports many types of container technology. No alteration has to be made to the container itself. 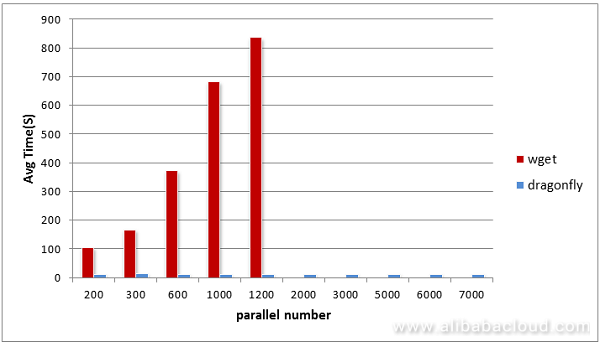 File distribution can be accelerated to as much as 57 times faster than native mode. Registry network outward traffic is reduced by over 99.5%. Dragonfly, carrying PB-grade traffic, has already become an important part of Alibaba's infrastructure to support business expansion and the annual Singles' Day (Double 11) online shopping festival.